Mamataji's day out. And a pretty postcard stuff. You can very nearly smell the gourmet coffee brewing. The very stuff which oozes just before an Election. Righton. Back to business. While I have conformation that the Budget speech was neither in Bengali, nor in Malayalam (as being widely propagated on cyberspace) it's very certain that AKG Bhavan (and Center) is abuzz with 'public relations' experts as to how to tackle this largely unprecedented pre-election attack. Whatever the politicians say or do, or before we start counting the chicken still in egg-protein form, let's see the facts for facts. Kerala at 2011 Railway Budget. 12 new trains. Amen. Because this is the number which makes all headlines for good reasons or not. Appreciation to the Minister and all those who worked for this. Chennai- Trivandrum Duranto. Excusez moi, but isn't this the 10th Express connecting TVC to the major South Indian Metro? And most of them run daily. All right, to cater and connect to the large transit commuter base and expat population in Chennai? But isn't the discrepancy evident when you note that the annoyingly snail-paced Island Express is the ONLY daily Express train connecting Trivandrum to the other similarly prominent metro Bangalore? Rajya Rani Express: Introduction of a new set of trains connecting state capitals with important cities/towns in those states: Nilambur Road - Trivandrum Link Express (daily) which could be a good option. Interesting to see if its is a night train or a day one. Mangalore - Palakkad Intercity Express (daily): Good one for Malabar as this would help solving the teething travel problems of the region to an extent. Ernakulam- Bangalore Express (weekly): Again I don't quite get the 'weekly' business in this route. How longer would we need to turn a blind eye and deaf ear towards the persistent accusation that this is a result of backroom dealings of the Bus Lobby? Kerala needs daily and overnight Express/ Superfast connections to Bangalore. Pronto! Nagercoil- Trivandrum passenger painfully extended to Kochuveli, just 8km away! On the infrastructure front, provision for new coaching terminal at Nemom provides hope, especially in view of Vizhinjam terminal. Though the Vizhinjam railway line is a separate budget allocation from Railway budget, it isn't too early to think or to send the nomad surveyors to Eastern suburbs and villages to see how Vizhinjam- Balaramapuram/ Nemom - Nedumangad/ Murukkumpuzha line could prevent a future heart-block on the Nemom- TVC- Kochuveli circuit. Mile-long snaky container trains on their way out via Trivandrum Central blocking all incoming trains as well as chronically locking down all level crossings isn't something we want eh? The same principle also applies to the already operational super-port of Vallarpadam. This budget also maintains its silence on how the container traffic from VICTT is channelized out of the state to peripheral industrial hinterlands. Survey for quadrupling the Edapally- Shoranur line is a good step in the right direction but a dedicated freight corridor parallel to the existing line must also be an open option. If Railways plan to utilize the already gasping Edapally- Trichur line to operate container traffic then "God bless the Queen" is all what I've to say. We have planned for rail business with Ministry of Tourism. If successful this year, we will expand the partnership' To improve look of railway stations and its approaches, the cost will be shared on 50:50 basis. The stations are : Madurai, Thiruvananthapuram, Rameshwaram. So what does this mean? Already Trivandrum, Ernakulam North and Calicut are on the list for modernization to Int'l standards with all those swanky features such as separate level arrival/ departures like those in aerodromes. So this new 'improvement of looks' confuses me. Have they scrapped the 'International-ization' project? Anyone? Most importantly, for the 4th consecutive year, the Coach Factory at Kanjikkode gets its honourable mention in budget without even a single piece of wrought iron yet to be manufactured there. The Cherthala also gets into Year II of 'mention'. That's a pass. 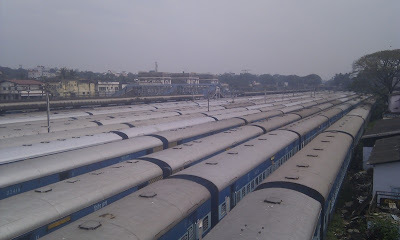 Rail Yatri Nivas & Budget Hotel at Trivandrum. Old wine in new bottle. Pretty curious to note that the proposal for a Railway Medical College on the premises of Pettah Rail Hospital promised in last years show, hasn't reached anywhere. Also there've been rumours that this is the same project that is now being planned somewhere in Tamil Nadu. Hello? Also some Water Bottling Plant was the toast last year, it has been replaced by something else. Some Mechanized Laundry or something. The issue is that Kerala is not craving for dozen new trains every year. While these weekly trains to far off Malayali niches are a bane, the reality that with every passing year the situation at home becomes more and more chaotic isn't to be strapped up in covers. That's is what the applauders for this Budget should check out. Kochuveli Terminal SHOULD be completed at any cost ASAP. Trivandrum Central can no longer cater to the existing traffic as it is choc-a-block. (See image on right) Trains are now held more and more in the outer and in suburban stations. Upgrading KCVL with completion of Platforms 2 & 3 along with the pitlines will solve the issues of managing, parking and servicing coaches to a great extent. Nemom Terminal is a very welcome step but if they're going to do it the same way as Kochuveli then things going to be back to square one. While land acquisition for the proposed coaching terminals will pose a problem for the State, the saturated terminal capacity in Thiruvananthapuram, Nagercoil, Ernakulam and line capacity are the biggest constraints for the Railways in commencing the new trains in the budget. The Railways cannot handle any more trains from the saturated Thiruvananthapuram Central. Handling Duronto Express sanctioned from Chennai will be an arduous task. “Unless the terminal facilities are improved at Kochuveli, the Railways will have to take the trains to Kazhakuttom or far-off places and bring them back at the time of the departure,” sources said. Punctuality of services, maintenance of rakes and the track and the movement of goods trains will have to be restricted as the line is choked.The announcement of projects and sanctioning of trains without taking into account the ground situation has come in for criticism. So there. With the elections out of the way, we may be back to ground reality in the next budget. But unless the state priorities itself instead of going on wild goose chases like Peninsular Railway Zone, things are going to stay put. Not going into the necessity and advantages of a separate Zone but a fully electrified and doubled main-line, parallel line to MC Road connecting Sabari line to Punalur and to Trivandrum/ Vizhinjam, connecting Malabar to Mysore which will drastically cut travel times to Bangalore & beyond and development of major terminals including Kochuveli, Nemom ought to be our priority to-do list. Adding more and more trains to the already crumbling and struggling infrastructure will only add more woes to commuters in terms of slow speeds and later running of trains, fuel inefficiency and man-hour losses, handling of trains in major station outer etc. Our representatives and officials ought to draft their necessities and prioritize the list in the best interest of the state.